For two winding transformers, the program automatically assigns the names TX-1, TX-2, TX-3, and so on. The bus from which the transformer connects, which must already exist on the one-line. Ensure that the From Bus has approximately the same base kV as the transformer's From Rated kV. For reference, the From Bus base kV is displayed next to the bus name. The bus to which the transformer connects, which must already exist on the one-line. Ensure that the To Bus has approximately the same base kV as the transformer's To Rated kV. For your reference, the From Bus base kV is displayed next to the bus name. If YG or YN is selected, grounding impedances can be entered on the Impedance tab under Grounding. The default settings are D-YG for ANSI, and D-YN with a phase shift of 11 for IEC. For IEC transformers, you can specify the phase shift as related to the notations on a clock. Select from 1, 3, 5, 7, 9, or 11. The high voltage side is used as the reference side. This option is available only if the Standard on the transformer is set to IEC and the short circuit calculation method in System options is set to IEC-60909. Standard Choose either ANSI or IEC. Type Type of cooling medium/insulation in the transformer (oil, liquid, gas, dry, silicone, or vapor). Class Type of cooling used by the transformer. Various combinations of forced air, water and forced oil are available. This field is used to determine the forced cooled rating of the transformer. Temperature rise rating of the transformer in degrees Celsius. Form Either core or shell type transformers can be selected. If Core is selected, the Z0% value on the Impedance tab is set to 0.85 of Z%. If Shell is selected, Z0% is equal to Z%. Rated kV Rated kV of a winding. The rated kV can be different than the base kV or the tap kV. EasyPower automatically adjusts the model to account for different taps, turns ratio and bases you choose. Tap kV of a winding. You can also specify the tap kV in terms of percentage of the rated value. If the actual tap kV is not known, enter the rated kV. Load tap changer control can be used to determine final tap settings if needed. EasyPower automatically adjusts the model to account for different taps, turns ratio, and bases you select. MVA or kVA Rating Self-cooled rating of the transformer. Use to select the unit in MVA or kVA. MVA or kVA O/L Forced-cooled rating of the transformer. 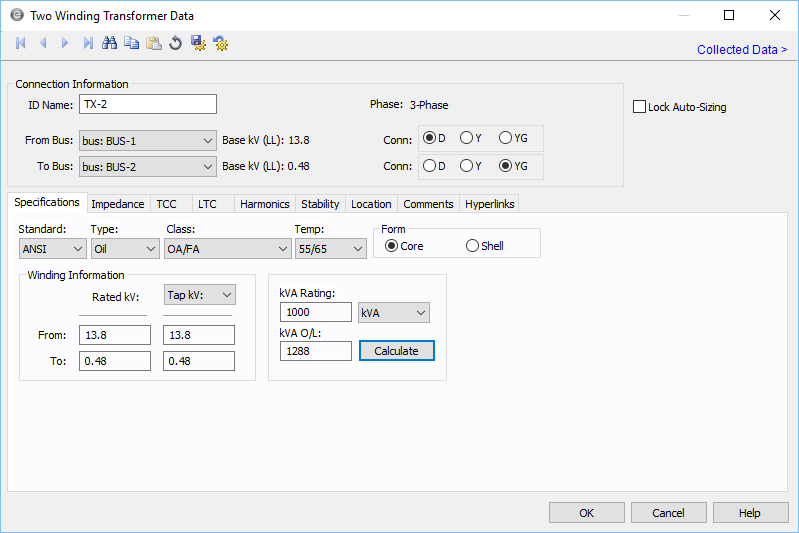 In the absence of this data, use the Calculate button to estimate the forced-cooled rating based on the Type, Class and Temp values you enter. Transformer nameplate impedance in percent. By definition, this is the positive sequence leakage impedance in percent on the self-cooled MVA and nominal voltage rating. The strict definition is the percent of rated voltage impressed on the high voltage winding to produce rated full load current in the short circuited low voltage winding. If the Standard selected on the Specifications tab is set to IEC, the impedance is based on the MVA O/L value instead of the MVA rating. The base rating at which the Z% and Z0% impedances are applicable. The kVA or MVA text is displayed depending on the rating unit selected in the Specifications tab. You can also enter the MVA or kVA base values from the transformer datasheet or nameplate. When you manually enter a value, the entered value is used to calculate the per unit impedances instead of the standard ratings. This field can be left blank. When this field is blank, the X/R ratio is estimated using the ANSI C37 curves. X/R Ratio Transformer reactance to resistance ratio, which is used to determine resistance value. Transformer zero sequence leakage impedance in percent. If you don't know this value, enter the positive sequence impedance (Z) for shell transformers (see Form field above). For core transformers, use approximately 85% of Z. If you enter this value as zero (0.0), the positive sequence impedance is used. If Z% is entered, you can use Calculate to compute the Z0% value if it is blank. X/R ratio for zero sequence impedance (Z0%). Enter this data from the manufacturer, if available. If this field is left blank, zero sequence R0+jX0 values are calculated based on the positive sequence X/R ratio. Fills in a computed value for the X/R ratio. You can override this value by typing in a different number. If Loss(kw) is not entered, the calculated X/R ratio curve is based on the medium ANSI Standard curve [ANSI C37.010-1979]. This curve was developed mainly for power transformers and is typically high for low voltage unit substations less than 2500 kVA. Grounding impedances only apply to wye grounded connections. The units are R+jX in ohms. If you only know the ground amperes of the circuit, enter the amp class and use the Calculate button to calculate the grounding impedance. Transformer neutral ground resistance in ohms. This is the most common method of grounding the transformer neutral winding. Grounding resistors are usually given in amperes. The impedance is found from the following equation. If the transformer is grounded through a separate grounding transformer with a secondary resistance, this resistance must be converted to the primary winding. Only wye grounded transformers are modeled with grounds. Mid or corner tapped delta windings are not modeled. Transformer neutral ground reactance in ohms. This is the current in amps through the ground impedance at the rated voltage. You can enter data in this field directly in amps or calculate it based on the voltage and ground impedance R +jX using Calculate. For generator step-up (GSU) transformers, you can specify an impedance correction factor. The range is from -20% to 20%. This appears only if the option is set to Show fields and X/R calculations based on IEC 60909 in Tools > Options > Equipment. Plot 100% Withstand TCC Select this check box to plot transformer damage curve for 100% withstand. This is without taking into consideration the derating factor for winding connection type and the type of fault. 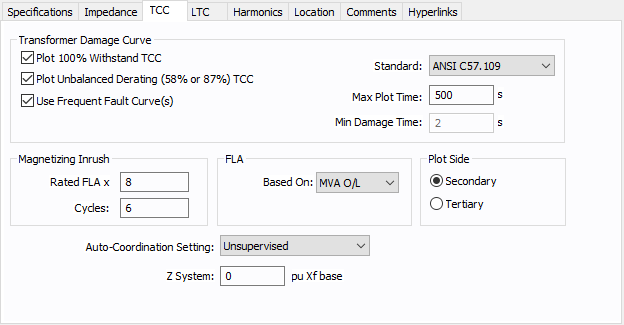 Plot Unbalanced Derating (58% or 87%) TCC Select this check box to plot transformer damage curve taking into consideration the derating factor for winding connection type and the type of fault. The transformer curve shifts left by 58% or 87% depending on the connection type. Use Frequent Fault Curve(s) Select this check box to plot the transformer damage curves as Category II to IV (thermal and mechanical withstand) for frequently occurring faults. The curve shifts towards the left depending upon the transformer impedance. Standard The standard according to which the curve is plotted. Maximum Plot Time The maximum time in seconds for which the transformer damage curve is plotted. When the IEC 76-5.4 standard is selected, the thermal ability of the transformer to withstand short circuit is plotted for the time specified here. The default is 2 seconds. FLA x Magnetizing inrush current as multiples of full load amps for the primary winding. Cycles Time taken by magnetizing inrush current in terms of number of cycles. FLA Based on Calculation basis for full load amps. “MVA O/L” is the MVA capacity for overload and “Rated MVA” is the self-cooled capacity. Plot Side (Three-winding transformer only) The side of transformer for which the short circuit withstand is plotted. Short circuit is applied on Secondary or Tertiary side. The primary line current is shown in the plot. Auto-Coordination Setting Specify whether the protective device is accessible only to qualified personnel (supervised) or unsupervised. This affects the protective device settings based on NEC rules. Z System While plotting the transformer damage curve, typical practice assumes infinite source (zero system impedance) on the upstream side of the transformer. You can include the upstream system impedance to lower the maximum fault current that the transformer sees. The system impedance must be converted to per unit impedance on the transformer MVA base. Tap Load tap changer (LTC) position can be placed on either side of the transformer by selecting From or To. If the transformer does not have an LTC, select None for standard fixed taps. Fixed off-nominal taps can be entered in the main dialog's Tap kV field. Step Size The default is 0.625 but you can type in your own percentage step size both here and in the power flow two-winding transformer temporary dialog box. Min Tap kV Minimum tap kV, which is used to determine the bottom limit that the tap can be adjusted to during a power flow analysis. This value should be the lowest tap on the transformer to get meaningful results. The default of 0.1 kV is not realistic and should be changed to the actual values if the LTC is used. Max Tap kV Maximum tap kV, which is used to determine the upper limit that the tap can be adjusted to during a power flow analysis. This value should be the highest tap on the transformer to get meaningful results. The default of 1500 kV is not realistic and should be changed to the actual values if the LTC is used. : Control value, which is determined by the Control Type field. Voltage: The control value should be entered in per-unit voltage. A typical range would be .975-1.01 per-unit, with 1.0 per-unit as a starting point. MVAR: The value should be entered in actual MVAR rather than adjusted per-unit. To determine what MVAR range is appropriate for a given transformer size, determine the MVAR flow without using an LTC, and multiply by .975-1.01 for an approximate starting place. LTC control is much more limited in strength and range than large generator control. : Determines how the LTC model is used. Voltage: The LTC attempts to control the voltage of the bus on the other side of the LTC. For example, if the LTC is chosen to be on the From side, voltage will be controlled on the To side. MVAR: The LTC attempts to control the MVAR flow through the transformer to a given value. Control Side The LTC can control the voltage or MVAR on either side of the transformer, regardless of which side the tap is located. Fundm Amps From Calculated rated amps on the primary (from) side. Fundm Amps To Calculated rated amps on the secondary (to) side. Rated eddy-current loss, Pec-r Eddy-current loss under rated conditions expressed as a percentage of rated I2R loss. Select the check box to enter stability information.